Need Help Paying for Your Procedure? 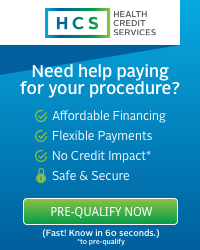 HCS provides access to financing solutions that help you fulfill your financial responsibilities while maintaining your long-term financial health. 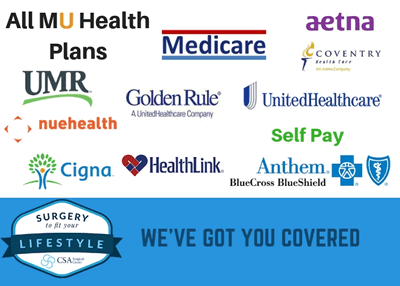 They offer a suite of affordable patient financing products built with budgeting in mind. You can choose the monthly payment that fits your budget, and if you decide to pay off early, you will not be penalized. Click the "Pre-Qualify Now" button to get started. We understand your insurance coverage exists for your benefit, and we're here to help you take full advantage of everything it offers. Our billing department will work directly with your insurance company to verify your benefits and determine a billing plan for the facility fees. You will receive a call prior to your surgery from the surgical center to discuss your benefits. Co-pays and deductibles will be due the day of your surgery. We accept most insurances and self-pay. On the day of your procedure please make sure you bring your photo identification, insurance cards and any payments due that day. ** if you are in the University Custom Network, your specimen and pathology will be sent to the University. We are here to see you through this process from start to finish. Please don't hesitate to call us with any questions! Below are commonly asked questions. If you do not find the answer to your question, please feel free to contact us. How do I get to CSA Surgical Center? Specific directions can be found on our website on our contact page. Will someone from CSA Surgical Center contact me before my surgery? Yes. You may receive a couple of calls from our facility. A nurse from the healthcare team will contact you to conduct a routine health assessment and provide basic instructions for surgery. Please plan about 10-15 minutes for this call. This is the time to ask any questions you might have about your procedure. I have already provided my health history information to my surgeon's office. Why do I have to review my health history with a nurse at the surgery center? The surgery center will receive all of your medical history information from the surgeon's office before they call you to review your health history. During this call, we will ask some additional specific questions that better assist our anesthesia provider in planning your anesthesia care. Your safety is our top priority, so we want to make sure all of the information we have on file is up to date, accurate and complete. This will also give you the opportunity to remember health information that you might have forgotten during your visit with the surgeon. Any tests needed before your surgery will be determined and ordered by your surgeon and/or anesthesia provider. Should you require such testing, you will be contacted before the date of surgery. We would like to complete any testing as soon as possible in order to review and prevent any delays. Be sure to have your doctor's office send all necessary paperwork regarding pre-operative tests and blood work to the facility. Call your surgeon's office if there are any changes to your well-being prior to your procedure. Colds, fevers, additional pain, etc. should all be reported to your surgeon's office right away. With advanced notice, we can try to avoid any delays to your scheduled procedure. Anesthetics are administered by contracted anesthesia providers which include anesthesiologists and Certified Registered Nurse Anesthetists (CRNA). The contracted anesthesia service has been chosen to provide services at the facility based upon their proven reputation for high quality patient outcomes. Yes. Before surgery, you and your anesthesia provider will discuss your medial history and review the anesthesia plan; this is when you'll be able to voice all of your questions and concerns. Make sure to communicate any anesthesia concerns you have during your pre-op call with the facility nurse. We generally ask that you avoid all food and beverages – even water, mints, chewing gum and tobacco products – from midnight on before your surgery. Otherwise, your procedure may need to be postponed. This may not always be the case, so more specific directions may be given during your pre-operative phone call. Are there certain medications I should avoid? Your doctor or nurse will give your specific directions regarding your medications during a pre-operative phone call. Yes, you will. Due to anesthesia you will not be permitted to drive for 24 hours after your surgery. If your procedure requires anesthesia and you do not have a ride home or a responsible adult to care for you after surgery, your procedure will be canceled. Surgical procedures, anesthesia and other medications can be very harmful to a developing baby. If you believe there is a chance you are pregnant, please notify your doctor, nurse and the facility prior to your surgery date. We will complete a pregnancy test before surgery if you are of childbearing age. Yes, please! Showering will help prevent surgical site infections. You may shower the night before and the morning of your surgery, but avoid aggressively scrubbing the area of the surgical site. Do not shave near the surgical site unless specifically instructed to do so. Do not use lotions, powders or perfumes after showering. You may apply a deodorant/antiperspirant unless instructed not to do so. Is it ok to wear makeup and nail polish? No. Please do not apply makeup the day of your surgery and remove nail polish prior to your arrival. Hand washing is one of the best ways to prevent the spread or transfer of germs and infection. The day of surgery do not hesitate to ask friends, loved ones- and even those caring for you at the facility- if they have washed their hands or used alcohol foam prior to entering your room. You should also take care to wash your hands throughout this process. No. We strongly recommend you avoid smoking the day of your surgery and for as long as possible leading up to the day of your surgery. Not only could it create complications with your anesthesia, but you could also experience a greater risk of nausea while recovering. What items should I bring with me on the date of my surgery? Photo ID and insurance cards; we are required to verify these during check-in at the facility. Without them, your procedure will be canceled or postponed until you can provide. A current list of home medications and any supplements you are taking. Any and all medications needed during your stay (i.e. inhalers). Wear eyeglasses and bring a case to store them in while you are in surgery; do not wear your contact lenses. Bring socks with you if you would like to wear socks in the recovery area. CPAP machine if you usually require one for sleep. Advanced directive if you wish to have on file at the facility. Do not bring any valuables like loose money, rings and other jewelry. If you are having anesthesia, make sure you arrive with a responsible adult who will take you home. You will be given specific instructions with regard to your arrival time the day before your scheduled procedure. If your procedure requires anesthesia, your arrival time usually be about 1 hour before your scheduled procedure. If you have not received a call with an arrival time by 2:30pm the day before your surgery, please call 573-777-3377 and ask to speak to a nurse. Why can't I know my arrival time sooner than the day before surgery? The surgery schedule may change several times leading up to the day before your procedure, so it is very common place to provide an arrival time the day before surgery to avoid multiple calls and confusion. If you require special accommodations due to transportation, please discuss with the nurse during your pre-operative call. We will do our best to accommodate your needs. How early will I have to arrive for surgery? You will arrive about 1 hour before your scheduled surgery time if your procedure requires anesthesia. The process to prepare you for surgery will take around 45 minutes. What should I do when I get to CSA Surgical Center? What will happen after check in? Once you are ready, your friends and family will be able to join you in this private room until it is time for your procedure. After changing, your belongings will be safely stored in the pre-operative area and will travel with you throughout your stay at the facility in the undercarriage of your transport cart. Remember to leave anything of value at home! We will ask that your cell phone and electronics are given to a family member before you go into surgery. There are no greater goals for CSA Surgical Center than to keep you safe and get you the care you need. We follow rigorous national guidelines and protocols (National Patient Safety Goals) with regard to both. What is your part in ensuring your safety? Please be patient and understanding when you are asked numerous times to confirm the same information. This process is all part of a proven safety initiative and you should find comfort in knowing your healthcare team is committed to your care and outcomes. Speak up. Do not hesitate to voice any concerns and ask questions throughout this process. Should I take my normal home medications the day of my surgery? There are certain medications we will not want you to take and certain medications we will want you to take. When can I see my family and friends after surgery? A nurse will be closely monitoring your vital signs after your procedure. As soon as you are waking up and able to move around, we will ask your family or friends to come see you. Your recovery nurse will discuss specific home care instructions with you and the responsible party who is taking you home. What if I'm not well enough to go home the same day? On rare occasions, your physician or anesthesiologist may decide you need additional post-operative care. In that case, you will be admitted to a nearby hospital. What should I do if I am not feeling well at home? You will probably receive crackers in the recovery area. You recovery nurse will review specific instructions for you to follow with regard to your immediate diet. Plan to drink lots of fluids (no alcohol) and initially maintain a very light post-operative diet. Some commonly recommended foods for the immediate post-operative period include soups, potatoes, pasta, applesauce and rice. Your recovery nurse will review specific instructions to care for your surgical site. Showering will help prevent surgical site infections. You may shower the night before and the morning of your surgery, but avoid aggressively scrubbing the area of the surgical site. You may experience pain after your procedure. Your surgeon will speak with you before your procedure about what to expect and, if necessary, how your pain will be managed. From the time you are admitted, to our post-operative call at home after you are discharged, we will be asking you describe your pain level and working to make sure your pain is well controlled. Follow directions for pain medication closely and remember that most of them will take at least 20-30 minutes to begin working effectively. Therefore, consider taking the next dose before the pain becomes unbearable. Why can't you call in my prescription for narcotic pain medication after surgery? Unfortunately, we are prohibited by law from calling in any controlled substance or narcotic pain medication prescriptions. Your prescription will need to be hand delivered to the pharmacy of your choice. A friend or family member may be able to fill your narcotic prescription while you are in the recovery area. What should I expect during my follow up call after surgery? If you are experiencing an urgent issue, do not wait for us to call you. Please follow up with your surgeon's office as instructed. Is my physician employed by this facility? No. Your physician, along with the other medical service providers, including anesthesia, radiology or pathology specialists, who use this facility are independent professional providers. Because these individuals are not employed by our facility, we are not responsible or liable for their acts or omissions. Why do you need to call me the day after surgery? You will receive a call from a nurse at the facility the day after your surgery (on Monday if your surgery was on a Friday.) This call is intended to check on how you are recovering, answer or clarify any instructions you received the day before. Call our main line at 573-777-3370 and our scheduler will direct your phone call to the appropriate person in our business office. Who will I pay for the facility fee? You will pay CSA Surgical Center. We accept all major credit cards, checks, cash, Health Credit Services and Care Credit. Will someone from the billing office contact me before surgery? You will receive a call from our billing office before your surgery. During this call our biller will provide an estimated cost for your procedure and establish a plan to obtain payment based upon a review of your insurance plan. Payment is required on the day of your surgery. Why is payment required on the day of surgery? The facility will purchase and provide all of the supplies and equipment required to complete your surgical procedure. Payment on the day of surgery allows the facility to ensure that these and other costs incurred to deliver high quality outcomes are covered. Yes, we can make payment arrangements for you. You will need to bring a check or credit card with you on the date of your surgery to set up your eplan (automatic withdrawal) payment. The monthly payment amount that has been agreed upon will automatically be withdrawn on the date you state. What does the facility fee cover? Our fees cover the use of the facility only. Facility fees DO NOT include laboratory/pathology, surgeon or anesthesia fees. You will be billed separately for these fees. What do I need to bring for the check in process? You will need to bring a photo ID, all insurance cards, and any payment due. Why is the facility biller only allowed to discuss the facility bill? Is an Explanation of Benefits (EOB) a bill? No. An EOB is an explanation provided to you by your insurance company after they receive and process your claim(s). CSA Surgical Center is committed to providing the highest level of quality care and patient satisfaction. To find a complete list of our center's initiatives and standards of excellence procedures, please click here.